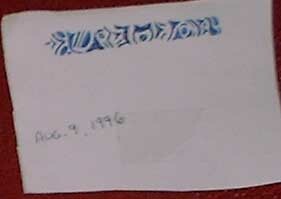 "My first experience was in November 1995. I was sitting at my desk at work. All of a sudden, in my upper left peripheral view in my left eye, a series of these symbols was visible in black characters, on a white shimmering background. They moved along so quickly (like a ticker tape) it was difficult to see any one figure clearly and this carried on for about 5 minutes. I was so shocked, I said "something is in my eye! ", then ran out of the room after viewing these for a few seconds. I wanted to find a secluded area to keep seeing them in privacy and give my full attention to it, so I went into the handicap washroom (a private room) and sat down to watch the rest of the show. 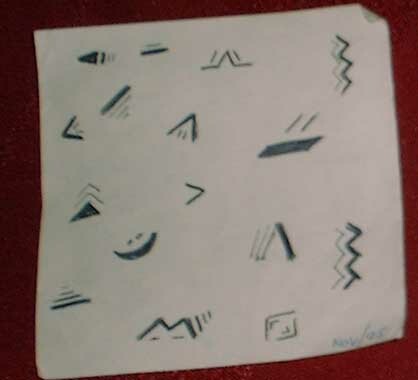 I tried to write down some of the symbols but there were thousands. Some kept repeating (like a language) so I tried to capture what I could on that little post-it note. The following year, in August 1996, I was in the shower at my home when this phenomenon happened again, and again it was in the left upper peripheral of my left eye. This time it seemed more decorative and hovered in one place with a centre point of a dark spot with an archway around it (refer to post-it note). It too lasted for several minutes and I wrote down as much as I could when I came out of the shower. In December of the same year, it happened again at home when I was sitting on the couch watching TV. This time there were more tiny lines in a row accompanying the symbols. There was a long gap in time until I saw it again in 2003, again, I was in my office at work. 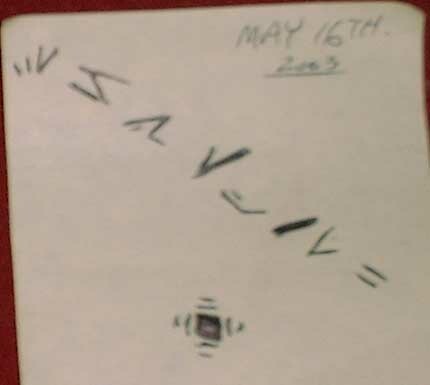 It was more in the centre of my eyeball (left) for the first time, but there were significant symbols just hovering in my vision, so I wrote some of them down. I was feeling frustrated and thought, what is this? I don't understand? why don't you just go away? I haven't seen anything since, but you can imagine my curiosity. It felt like someone was trying to communicate, but what good is it if I can't understand? I have tried to look in books, and on internet, etc. to no avail. Well, I hope this information is of some help to you. You are my last hope in figuring this out." Our thanks go out to the experiencer for sharing these symbols with us. 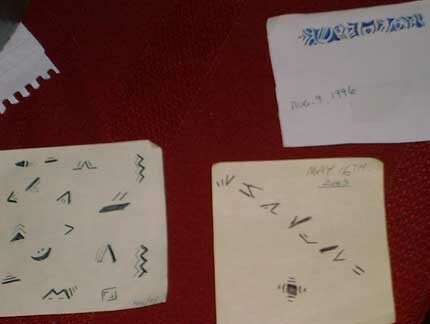 Do you have any information or thoughts on these symbols, and events that you'd like to share? Have you had a similar experience or have you come across similar symbols or events such as the ones described above. If so please contact us, admin@psican.org Your privacy will be protected, and confidentiality is assured.